Whether you are cooking a family meal or preparing a tasty dinner for one, these two seasoned cookbook authors have you covered with everything from vegetarian Bibimbap to Roasted Chicken with Mango Chutney. Start with cups of vegetarian broth, simmered with salt and a tiny bit of sugar to round out the flavors. Add rice noodles, tomatoes, peppers, and eggplant—roasted over the open flame of gas burner—and top it all off with herbs, chili oil, ginger, and lime wedges. The outcome, a bowl of Smokey Summer Pho, is a delicious variation on the pho and ramen dishes that are taking the country by storm. Because there are few precedents for these VEGETARIAN dishes, Lukas Volger, the founder of a premium veggie burger company, spent years capturing their full flavor. The accessible recipes are now available in BOWL: Vegetarian Recipes for Ramen, Pho, Bibimbap, Dumplings, and Other One-Dish Meals. The meals, which offer both guidance and opportunity for experimentation, are designed to help you get the most from your farmers’ market haul. Ways to optimize seasonally fresh ingredients: Recipes like Spring Ramen, Smokey Summer Pho, Vegetable Curry Laksa, Black Rice Burrito, Spicy Tofu Bibimbap, and Spicy Tofu Bibimbap take advantage of vegetables at their best. The recipes in BOWL are weeknight-friendly and filling, because their primary ingredients are vegetables and grains. Volger, a popular cooking teacher and an expert in vegetarian recipes, knows how to optimize the flavor of your vegetables. 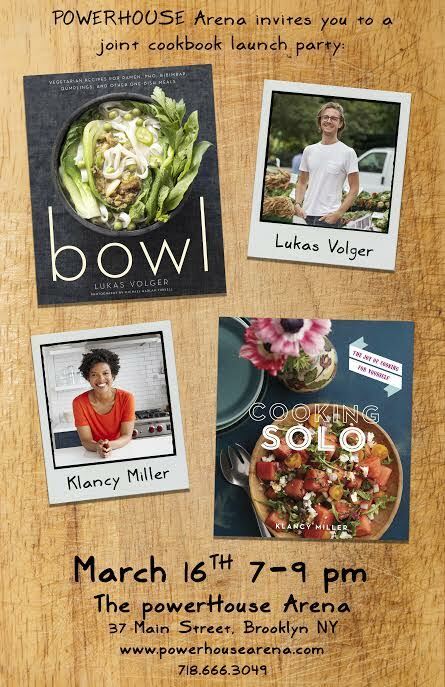 Full of innovative and delicious recipes, BOWL is the perfect cookbook for all vegetable lovers looking for a flavorful, meat-free meal. The number of people choosing to live (and eat) alone is higher today than ever before, but most recipes and menu plans are still made to feed a family of four. For food writer Klancy Miller, cooking for yourself is about more than avoiding endless leftovers and sky-high bills from too many dinners out—it’s about eating the good food that you deserve. COOKING SOLO: The Joy of Cooking for Yourself is Klancy’s charming guide for solo cooks looking to enjoy fresh and creative food at every meal. Eat a Proper Breakfast: Start off the day right with perfectly-portioned breakfasts like Chocolate Pancakes with (Oh My Gosh) Ganache, Fastest-Ever Handmade Granola, Frittata-Soufflé for One, and Broiled Grapefruit with Cardamom. Take a Lunch: Ditch those office takeout menus with grab-and-go lunches like Grilled Blue Cheese with Curried Red Onions, Roasted Chicken with Mango Chutney on Rye (a.k.a. “The Tina Fey”), Scavenger Hunt Fried Rice with Kale, and Panzanella Per Una. Entertaining Friends: Show-stopping dishes to please every party guest, including Spicy Coconut-Sweet Potato Soup, Bacon with Brussels Sprouts and Apple Butter, Lemony Kale Risotto, Cornbread Waffles with Jalapenos and Sun-Dried Tomatoes, and Gluten-Free Chocolate Chip Cake. Meals with Meat: Klancy urges readers to make the most of top-quality meats when they try Mood-Boosting Rib Eye, (or “Valentine’s Day: An Unromantic Comedy”), Beef Tacos (inspired by Aziz Ansari), and Four Meals in One: Tarragon-Roasted Chicken Equals Dinner plus Tacos, Salad, and a Sandwich. Alongside these fun, approachable recipes and lush photography, Klancy shares stories of the adventures that inspired each dish, from her travels in France and Tahiti to a disastrous Valentine’s Day and a game-changing comedy show. As a bonus, many of her 100+ weekday-ready recipes come together in 30 minutes or less – with a few luxurious exceptions, of course. Table for one, please! Lukas Volger is the author of Veggie Burgers Every Which Way and Vegetarian Entrees that Won’t Leave You Hungry, and founder of Made by Lukas, a premium veggie-burger company. The editorial director of the biannual magazine Jarry, he has been featured on the Splendid Table and in the New York Times. Klancy Miller is a writer, pastry chef, host of waffle parties, and passionate Francophile. She has contributed to Food Republic and appeared on Food Network’s Recipe for Success. She graduated from Columbia University and Le Cordon Bleu Paris.